Side one of the album winds down with a real anomaly. “The Prayer” was another of the six and a half minute tracks that anchored the album, but while “More, More, More” and “Bad Day” were the hit singles, “The Prayer” felt much more like the work of improvisation as for two minutes double bassist Jim Paris jammed with conga players Isaac “Kofi” Osapanin and Johnny Folarin until just when the song structure stretched to the breaking point, Ms. McCourt made her dramatic entrance to the track. The piece was more of an “extended haiku” than a song as we normally think of it. There’s an airy, disjointed feel to it and its eventual structure belies the intro, which really did sound like an improv. I suppose on an album that was arranged to within an inch of its life on some tracks, which paradoxically, were incredibly brief and fast paced, there had to be room for the fledgeling band to move in the opposite direction. Side two began, as did side one, with the huge brass section Sounds 18, joining in to embolden the sound. “Rockin’ On Suicide” must take the cake for ironic juxtaposition of music and lyrics. I love the contrast between happy music and downbeat lyrics, but they don’t get more polarized than on this track; a jubilant swing jazz rave up as sang by a corpse. At least, that’s what I take form the lyrics. Then, the album reveals its hypnotic dub heart with the compulsive “Rue St. Denis,” which was sung in French. The dry, Simmons drums as played by Gerry Darby, thwack along in the staccato intro while Carmel echoes their meter vocally. Once she began to sing, the congas along with what sound like deep, deep throbbing Syndrums® create a hypnotic rhythm that lurches along the Parisian underbelly and ground zero to six hundred years of prostitution. The liberal echo and dub technique employed by producer Mike Thorne throughly manages to create an environment on disc where thick clouds of ganja and strobe lights conspire to relieve the listener of their senses entirely. Then the trump card was dealt when toaster Crazy Joe began reciting dub poetry while the whole track coalesced around him like smoke. It’s the sort of song that creates an entire environment for the listener. It’s simply incredible. The band picked their second single, an amazing cover of “Willow Weep For Me” only to see it go nowhere. Their A+R rep wished them the best of luck, but I simply can’t imagine such an adventurous track this this one going anywhere in the increasingly conservative UK music market of 1984. The almost unrecognizable blues number was completely re-wired with some of the most compulsive rhythms I’ve heard in music since Brian McGee left Simple Minds. Two half notes were rapidly followed up with a frantic series of six eighth notes for an almost trance-inducing krautrock feel. It’s been stuck in my head all day as I have been focusing on the breakdown/false cold ending that seems to stop the song dead at the 2/3 point before Darby brings the rhythms [that had actually stopped two measures earlier while rhythmic fills continued along] back with a vengeance to continue the song for another 45 seconds. “Tracks On My Tears” was a cool jazz take on the Smokey Robinson number. Using the traditional jazz template of taking a familiar pop number and pushing at its outlines until it soon evaporated in a puff of blue notes, by the time the listener noticed something was amiss, it was no longer the same Motown song. The album ended with the unlikely hit single “Bad Day.” The six and a half minute humber was recorded live in the studio and producer Thorne left in a few seconds of off the cut studio chatter before the track ultimately unfolded. Hearing Thorne tell the story of how he worked with these still not fully formed musicians in their first big money sessions was an eye opener. Carmel was used to hearing her voice reproduced on a cheap practice amp from a hand held mike. When confronted with a vintage Neumann, she apparently put up a catfight until she was shown how transparent is made her sound. Mike Thorne’s full disclosure of the recording of “Bad Day” can be found here. I’ve never heard the 7″ version [recorded separately, not an edit of the LP track] but since it’s in the Record Cell, I suppose that I should get around to it one day. 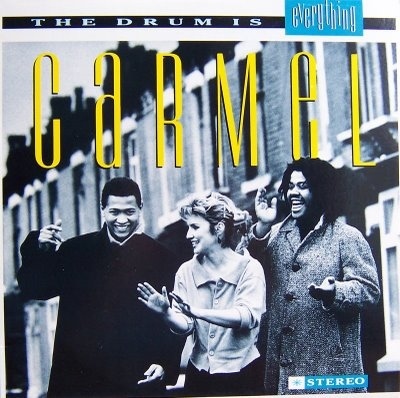 While all of Carmel’s music was fervid and packed with sometimes intense feeling, many of the more intense numbers were crammed, complete with incredibly busy arrangements and time signatures into songs of scant length. While the effect could be breathtaking and hair-raisingly intense on such tracks, I can’t see much of the album ever being played on the radio. Such uncut feeling and intensity of playing is not for everyone’s ear. “Bad Day” was highly emotional, but it was fitted into a bluesy template that was calm and measured. 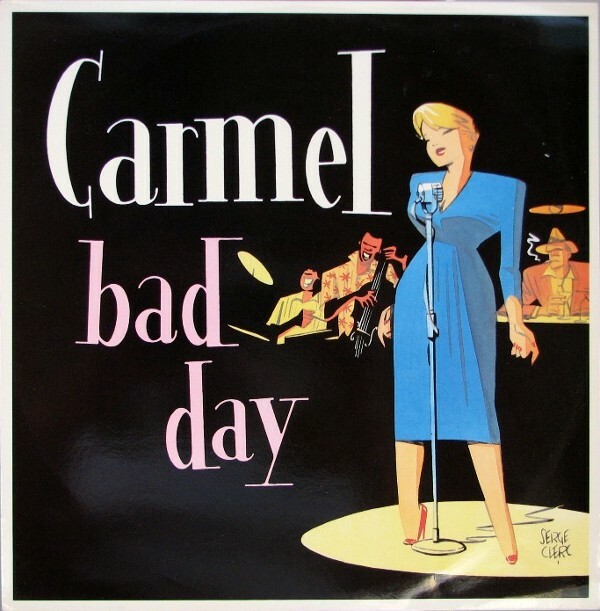 While I would have picked “More, More, More” as the breakout hit here, I can’t complain that “Bad Day,” a much more unlikely contender, was the song that gave Carmel a huge career boost. While it’s more traditional sounding than much of the album, its emotional payload pointed the way forward for the band who produced an album closer to this standard afterward. This entry was posted in Core Collection, NWOBJP, Record Review and tagged 1984, Carmel, Mike Thorne, The Drum Is Everything. Bookmark the permalink. I aways thought there was something very obviously missing from the soundtrack to Absolute Beginners – regardless how one might think of the film. That thing was Carmel – or at the very least Ms. McCourt! Colin MacInnis wrote a gritty, trilogy about London’s changing life that was fast and raw, young and rebellious. This is exactly what The Drum Is Everything evokes. Maybe they were asked and declined, or maybe Julian Temple and company just missed the mark. Echorich – Maybe not being on the “Absolute Beginners” OST was to the band’s benefit. Sure, sure. Working Week, Sade, and The Style council were there, but so was adrift 80s Bowie. Would you want to share vinyl with Eighth Wonder? If Carmel had been there, I think it would have required a re-think of the soundtrack. Make it more inspiring than the film maybe deserved. No, I think the OST was probably just right for the film, which I’ve never seen, by the way. I think you are on the right track Monk. The film was a weak interpretation of a book I hold really dear. In fact I’ve always had much more affection/affinity with MacInnis’ London Trilogy than Kerouac, and the NY Beats – well maybe GInsberg’s Howl deserves my high praises if I give it some thought. It’s the Anglophile in me. Anyway, Temple made a film that was way too Hollywood at the same time that it tried to be way too hip – a disaster basically. Working Week was possibly the closest to finding a band that could capture the Afro-Caribbean-Jazz sounds that MacInnis’ prose highlights. The Style Council’s contribution was one of the best placed songs in the film and doesn’t feel as forced as much of the rest of it. Sade’s Killer Blow is probably the most memorable track from the album. johnnydark – No, thanks for the tip! I tried to register on the new Carmel website but some webmaster forgot to add the script to do so!